Events are moving more quickly than ever, a situation to be expected as the world hurtles, out of control, toward World War 3 and the Great Tribulation. While most of the Western nations’ citizens wrestle with their everyday lives, they do not see the trouble that is coming. If only they could be made to look up from their situations so they might escape these things by fleeing into the wilderness! Will Jordan Bear the Brunt of Trump’s Agenda? Trump’s destructiveness could destroy Jordan in his grab for power and oil, Israel’s ‘spoil’. Last week, I said that if Trump wants Jordan’s cooperation with his coming peace deal, the US will have to belly up to the bar and provide funds for Jordan. The day after I posted my report, JPost reported that Trump plans to provide funds to Jordan and to Egypt for his upcoming peace deal, but it comes with a heavy price tag. Let’s see what that price tag is. The article starts: Donald Trump will push for Jordan to grant citizenship to one million Palestinian refugees as part of his “Deal of the Century”. Trump will also ask Egypt to grant citizenship to Palestinian refugees. Granting Palestinian refugees a citizenship status from other countries may be a way for Trump to avoid establishing a Palestinian state. The report hints that a confederation of three states may be an option, where there would be a joint government between Israel, Jordan, and the Palestinian Authority for specific and limited purposes. …Jordan and Egypt will receive USD $110 billion in economic aid. It is not yet clear where this reported aid will come from. Jordan would receive USD $45 billion, and the remainder would go to Egypt. Part of the deal would also include giving Jordanian land, Naharayim and Tzofar, to Israel. These enclaves are currently leased to Israel [by Jordan], but are officially Jordanian land. (These are the land leases that Jordan refused to lease to Israel again last November). In return, Jordan would receive land from Saudi Arabia. The reason the peace deal calls for “security arrangements” will require cooperation between Israel and the US in the West Bank. What I just read to you is the reason there will need to be security arrangements. Pushing the Palestinians out of their homes in the West bank will cause a war to break out there. US troops, acting as the scriptural Gog of Ezekiel 38, will position itself in the West Bank – the mountains of Israel – as a security force. Gog – the President of the USA – is now in charge of the “spoil” oil in Golan. In return, Trump is giving Golan to the Jews to the tune of 100,000 Jewish migrants to settle there, which will push the Druze out of Golan, and he plans to give the West Bank to the Jews, as well. The world will rise up against this. Iran and Russia – the Shi’ite 4+1 Coalition AKA the ‘King of the North (Daniel 11:40-45) will see not see this favorably. Many of the Arab States will not, either, but Trump will buy them off with various bribes, promises of money, land swaps and other favors for their continued support of his and Israel’s new policies. But the worst part of this will be YHVH’s reaction. The State of Israel has defied YHVH’s specific instructions for the Jubilee years. This will be one of the reasons for the State of Israel’s destruction in the end of days. 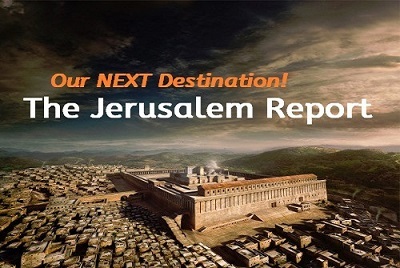 There will be a modern repeat exile for the House of Judah Jews because of the Jubilee and Sh’mittah year violations just as there was in Chronicles 36:20–21, 2 Kings 19:29, Jeremiah 34:8-10 and elsewhere in scripture. This is the reason they were sent into Babylonian exile. In the years 2016 to 2018, the State of Israel celebrated a Jewish Jubilee. The problem is that Biblical Israel is not only Jewish – House of Judah. The State of Israel is not Biblical Israel, either. Biblical Israel also belongs to the House of Israel which was restored by Yeshua, but who the Jews deny part of the Abrahamic Covenant even though the spiritually reborn swear fealty to the God of Abraham, Isaac and Jacob – our Father. They deny us because they deny that Yeshua came to restore us to His Covenant with us through Abraham. They deny Him because they don’t want us back in the Covenant. To that end, and because their Talmud supersedes the plain and simple instructions of the Torah, the Jews are not willing to follow the Torah’s edicts regarding the Jubilee which provides for the complete restoration of all tribes in the land. The House of Judah Jews are planning to confiscate all of YHVH’s land for themselves without restoring all of YHVH’s people and in doing so, they will bring destruction on the political UN-created State of Israel. That is as it must be since the State of Israel is not Biblical Israel. Thus, Trump and Netanyahu continue on this path that will set up the Gog-Magog war and the attack by the King of the North, Iran. Politicians and news pundits view this situation as diplomatic in nature without understanding the causes. Scripture, however, shows us the cause of the events which go back 4,000 years. Men and women who do not understand that today’s events began thousands of years ago miss the significance of what they see, can’t find a solution and don’t know what the outcome will be. It is only when we understand how every little situation from way back then affects us today that we can understand what is happening, know what the solution will be and the outcome of it all. This, in itself, will help us get through this ordeal without all the stress and anxiety. The fact of the matter is that YHVH’s land of Israel does not belong to any of us. It is our inheritance, yes, but the land belongs to the Father. We get to live on the land and have our piece of it, but it is, and always will be, His. No tribe or group of tribes, such as the House of Judah Jews, is permitted to make decisions about the land other than the decisions that were made before the foundation of the earth was laid and the lamb slain (Rev 13:8, Eph 1:5) for our coming sins against YHVH. Why does the land not belong to us to carve up anyway we see fit? It is because the One who has given it to us is still alive and will remain alive eternally. It is only after the death of a man that his children take possession of the inheritance he left them. Their inheritance is theirs even while he still alive, but it is only at his death that they gain full control of the inheritance. The Jews and Americans – led by Benjamin Netanyahu and Donald Trump – each have their own agenda. Each wants to do something different with YHVH’s real estate. But each will suffer for their theft of YHVH’s land. They will suffer together even though their agendas and desires for YHVH’s land are different. The Jews want a “Jewish only” State where no one but Orthodox Jews will reside. The House of Israel, led by America’s President, Donald Trump (who I strongly believe is the end time ‘Gog’ of the land of Magog) wants to regain his ancestor’s – Reuben’s – firstborn place in Israel and with it to have the double blessing that comes with the firstborn position – ruling over the land, the Jewish people and controlling the House of Israel’s fossil fuel wealth. The Jews and Americans are fighting over the same territory, but they aren’t being honest with each other about their agendas and they’re going to run into trouble with each other, with their Palestinian brethren and their mutual enemies at the same time. The Evangelical base of Trump’s election train is running along the Jewish and Trump track. In this March 9, 2019 article from Axios.com, we learn that the White House has been engaging with Evangelical leaders to reassure them about the plan. On March 7, 2019, an off-the-record meeting was held between the White House and leading Evangelical leaders such as John Hagee, Jentezen Franklin, Pastor Paula White, Joel Rosenberg and others. Evangelicals herald Trump almost as much as the Jews – as a type of messiah, but Trump may cause Christians to bring YHVH’s curse on themselves like Balaam did in Numbers 22. Now, let’s turn our attention to how Trump may cause Christians to bring the ‘Balaam’ curse on themselves. First, we need to understand the Biblical account of Balaam. What is the ‘Balaam curse’? It was Balaam’s way of getting the Israelites in the wilderness to bring YHVH’s curse on themselves. Balaam had been unable to curse the Israelites on behalf of King Balak of Moab (Num 22). After his utter failure, Balaam told Balak to get the daughters of Moab to mix with the sons of Israel, an act which was specifically prohibited in YHVH’s Kingdom instructions of the Torah. That was the recommendation of Balaam. Numbers 25:2 And they called the people unto the sacrifices of their gods: and the people did eat, and bowed down to their gods. This happened because Balaam suggested it to Balak. This also resulted in Phineas, Aaron’s grandson who was in line for the High Priesthood, to kill Zimri and Cosbi, in the Tent of Meeting (Numbers 25:14). Israelites curse themselves by disobeying their King’s express commandments. One of these commandments is that Israelites are not allowed to mess with His land. They cannot take each other’s tribal territories (Deuteronomy 19:14); they are not to make treaties (covenants) with other nations (Exodus 34:12) on behalf of YHVH and they are not to use His land for bartering (land swaps). Aside from the fact that Christians understand Israel should not be divided, they are still helping President Donald Trump with his plan. In fact, I have debated with people in recent years over who will divide the land. Would it be YHVH’s own people – the Jews and Christians? Or would Israel’s enemies divide the land? I think we may be about to find out. Evangelicals are on the front lines helping President Trump craft his plan for peace in the Middle East. “We were stunned by that,” said Pastor Jack Graham of Prestonwood Baptist Church in Plano, Texas. They’re so happy to have the political prestige that they are now involved in dividing YHVH’s land! Pastor Graham was surprised when the White House decided to court faith leaders for input on its Israeli-Palestinian peace deal. “We talked about, of course, the sovereignty of Israel that is very important for Christians – Bible believing Christians – that Israel has a right to exist and Jerusalem as its capital,” said Graham. Graham told that to Secretary of State Mike Pompeo along with the president’s son-in-law Jared Kushner, adding that the security of Israel needs to be in the proposal. Pastor Jentezen Franklin of the multi-site Free Chapel based in Gainesville, Georgia agrees. He too was in the meeting. “There is something that is working – people like Jared Kushner and Jason Greenblatt and others are working, trying to find some middle ground,” Pastor Franklin said. Oh, my word! YHVH’s own people – those who call themselves by His holy Name, but who for the last 2,000 years and more have been profaning His Name – are on the front lines of dividing the holy land of Israel! Christians who cooperate with Trump’s peace plan will suffer under the Balaam curse. The challenge lies with the Palestinian Authority which has refused to speak with the White House since President Trump recognized Jerusalem as Israel’s capital. “Everyone needs to live with hope. Many Palestinian people are living without hope,” Graham said. “God cares and loves the Palestinians and so do we in the Evangelical community, but we cannot allow parts of Israel that serve so greatly to protect and secure the people of Israel to be given away,” said Franklin. Really? So, you would rather throw the Palestinians – YHVH’s physical House of Israel people – out of the land? Christians don’t know they are part of the Kingdom, too. Somehow, Christians doctrine is so skewed and full of falsehoods that Christians don’t even know they, and the rest of the House of Israel, are to inherit the land. Christians believe the ‘heaven’ lie and leave the land of their inheritance to the Jews. You may be thinking that the Palestinians are not believers and cannot inherit the Kingdom. And you would be correct. However, there are commandments for how to treat the ‘ger’, the strangers, among you that the Jews do not follow starting with being kind to them. Spiritually, the Palestinians are ‘ger’, strangers. But physically, they are over 60% Hebrew. It is probable that the percentage of Hebrew DNA in the House of Judah – the Jews – isn’t much higher. There are no pure physical Hebrews on the earth. In fact, from the time of the Exodus, there has been other DNA mixed in with Jacob’s children. This is because YHVH promised Abraham that all the families of the earth would be blessed through him. At the end of the age, which is where we are now, YHVH has not kept His promise if every earthly family doesn’t have Hebrew DNA. But how many are Israelites, spiritual Jacob, that has been born again? How many Jews do you think are born again? Yeshua’s gospel message is as much for the Jews as everyone else. Almost no Jews anywhere on earth are born again except Messianic Jews. But Messianics are the least sect of Judaism. So, in the political UN-created State of Israel, most of the Jews are not born again, either. So, why do they deserve the land more than the Palestinians? Let’s not castigate the Hebrew Palestinians for not being born again. Both Houses need to be born again through Yeshua. But before that can happen, the two Houses need to stop what they are doing to each other. The Jews need to recognize the right of the physical House of Israel descendants to have their share in the physical land inheritance and the Palestinians need to stop trying to destroy the physical House of Judah. The time immediately following the Gog-Magog war will be when YHVH will pour His Spirit on both Houses. That is when they will all be born again. A judgment is coming for those who reject the Torah and refuse to drop this unholy 2900-year-old civil war. Neither side is right with YHVH! Neither side is righteous! The Jews would rather disobey the Jubilee of restoration and push the physical descendants of Israel into Jordan and Egypt so that the four tribes of the House of Judah can have it all! By helping Trump, these Christians are rejecting their own heritage! They are not calling for all the tribes to be restored. In essence, Christians are telling their Elohim they don’t want His gift. Let me tell you what happens in the worldly world of kings when a king decides to bestow a piece of land to a favorite at court. If that recipient should say the least negative words about the land parcel or should reject the gift in any way, that person would be put out of court – at the very least – or might even be executed for treason against the king. This is what happens in the world, folks! What do you think YHVH wants to do to the people who call themselves by His name, but they reject His Kingdom by rejecting the laws of His Kingdom and they reject His land, too? Christians want none of their allotted land inheritance, while the Jews want all of it! Both are in breach of the Torah and are rebellious. This situation puts YHVH to shame! Joel Rosenberg, a personal friend of Mike Pence and Mike Pompeo, told the other Evangelical leaders that Palestinian President Abbas would never make a deal, so there is no need to be too be worried that Jerusalem is going to be sacrificed. Let me go down a trivial, but interesting, rabbi trail for a moment. The two Mike’s in the White House are interesting to me for just one reason: Their name. The name ‘Michael’ means “like Elohim”, or “like God”. Don’t you find it interesting, like me, that these two men are acting like ‘god’ in the White House? Which ‘god’ are they being like? Donald Trump who is usurping our Elohim’s authority over Israel?! Ok. I just had to throw that in! Now back to the RawStory article. Indeed, support from the Palestinians did not seem important to the White House, according to RawStory.com. And Jason Greenblatt, the U.S. envoy and former Trump Organization real estate lawyer, repeatedly slammed the Palestinian Authority following the meeting. Rosenburg also said, “We need to allow the President freedom of movement and latitude to present a plan that would allow those Arab states which are more willing than ever to make peace with Israel to move forward. We need to give the Arab States the ability to support this. If the Saudis, the Egyptian and others can say that this plan is credible it will open the door for, after the Palestinians say no, to talk about how to move forward with Israel,” Rosenberg reportedly said. Trump has the Evangelicals so hoodwinked that they are becoming more and more willing to not only let him do what he wants to Israel, but they are blatantly supporting him in it against the commandments of scripture! “So far, however, Kushner’s efforts have led only to Palestinian outrage and his own embarrassment, especially after the Arab ally he was most successful in cultivating in his efforts to gain recognition of Israel, Saudi Crown Prince Mohammed bin Salman, was implicated in the murder of a Washington Post journalist and became an international pariah. The Palestinian response has been to refuse to engage with Washington at all,” Foreign Policy reported. It is my belief that Trump always had the intention of removing the Palestinians from Israel. From the start, the administration has said the Trump plan would be different than all the others previously submitted. Trump, though, would have preferred the Palestinians to just do what they are told to pack up and leave their homes! But, hey! With or without their cooperation, Trump plans to cast them out of the land and he is happy to do so at the sharp point of the sword! Gog will fight in the Mountains of Israel AKA Samaria AKA the West Bank, and for this rebellion Gog will suffer the worst defeat that ever any Hebrew Israelite has suffered! The Mountains of Israel are called “Mountains of Israel” because they belong to the House of Israel. In the days of Joshua, long before the split in the Kingdom, this territory called “the Mountains of Israel” were Ephraimite and other northern Israelite tribal areas. This area never belonged to the tribe of Judah. It didn’t belong to Simeon or Benjamin, either. Wikipedia: As recorded in the Book of Joshua, the territory allocated to the Tribe of Ephraim was at the center of Canaan, west of the Jordan, south of the territory of Manasseh, and north of the Tribe of Benjamin. The region later named Samaria (as distinguished from Judea or Galilee) consisted mostly of Ephraim’s territory. The area was mountainous, giving it protection, and also highly fertile, giving prosperity. Joshua was the leader of the tribe of Ephraim. In fact, Joshua led all the Israelites – all 12 tribes – during his lifetime. The capital area was in the “Mountains of Israel” which became known as Samaria then the West Bank. The Jews have coveted Ephraim’s territory for thousands of years and, now, Netanyahu has made an election promise that he will annex the Ephraimite West Bank settlement territory if he is re-elected. Netanyahu told Channel 13 he had communicated to U.S. President Donald Trump that he would not evacuate a “single” Israeli from Judea and Samaria as part of a forthcoming “deal of the century” Mideast peace plan, which Trump is expected to release in May following Israel’s April elections. This last statement makes is sound like Netanyahu is “standing up to” Trump when, in fact, they are colluding. But Netanyahu needed to present himself as a brave and strong leader for the electorate. I believe Netanyahu already knows what is in Trump’s plan and there is nothing in there about moving Israelis out of their settlements. So that was a moot and unnecessary statement on Netanyahu’s part. Those who will be moved will be the Palestinians. At the time of this recording, the Israeli election is too close to call. But close or not, the result will only be known weeks from now when either Netanyahu or Gantz show which one is able to form the next government. Because of Israel’s weird electoral process, a candidate can win the popular vote, but not be able to form a government coalition. So, the truth is that it will be weeks before we see who takes Israel’s helm. Peace Plan: One, Two or Three States? Israel Unwired says Netanyahu’s announcement is a move away from the Two State solution. This announcement is huge, moving the goalpost away from the “two-state solution”, that never even had a chance, to the actual sole solution of living peacefully with our Arab Muslim neighbors by Israel applying sovereignty in our ancestral homeland, Judea and Samaria, where most of the Biblical stories actually took place. Let me tell you that YHVH will not see Trump’s solution as a move away from the Two State solution, the dividing of the land, but as merely another form of it, a form that is worse than the one Obama planned for Israel! Moving Abraham’s physical descendants out of Israel presents YHVH with no other option than unleashing the full force of the Great Tribulation to re-establish His own sovereignty, in His own land, which His own people deny, in His own land. Dividing YHVH’s land by one means or another is still to divide His land and He won’t allow it! Here is more from Israel Unwired: Under the Palestinian Authority and Hamas, non-Muslims are persecuted. Forget about apartheid, non-Muslims are persecuted. Don’t get us started about the other Muslim countries in the Middle East. Israel is the ONLY country with freedom and equality for all. And those Arabs in Judea and Samaria who would live under Israeli control would enjoy more freedom and equality than they do under their own Palestinian Authority and Hamas leadership! Oh my! Either this author has not heard what has happened to the Palestinians since the Jewish State bill took effect, or he has his head somewhere that it shouldn’t be! The truth is different than this Israeli media outlet says. Anyone who is not Jewish in Israel – Palestinians, Druze – now have second-class citizenship status as I have reported since last July. This Fox News headline from April 3, 2019 says it all: In Israel election, Palestinians are nowhere to be found. As I reported a couple of weeks ago, the Palestinians no longer have the right to vote in Israel! They are not equal citizens in Israel! This JPost article says: This week, Israeli citizens, including 600,000 living in areas Israeli troops occupied in 1967, will vote in a general election that will determine the next prime minister, and more importantly for us, the next army ruler: the defense minister of Israel. Yet, millions of Palestinians continue to live under Israel’s military rule and cannot vote in this election. The Israeli government doesn’t care about our complaints because we don’t vote. And let’s not forget that the Palestinians, called Arabs, have political parties in Israel, in the Knesset for whom their Palestinian constituency cannot vote! It is frustrating that Israeli news outlets continue to spout lies to the American and Western publics they target. American Jews know better and almost 2/3 of them are unhappy with both Netanyahu and Trump. The Palestinian Authority is preparing to change hands. Palestinian Authority Prime Minister-designate Mohammad Shtayyeh will announce the makeup of his new government in the coming days, Palestinian officials said Monday. Shtayyeh has until April 14 to form a new government that is expected to exclude all supporters of Hamas, longtime rival to the Fatah movement of both Shtayyeh and PA President Mahmoud Abbas. Abbas on March 10 charged Shtayyeh with forming the new government, replacing Rami Hamdallah’s technocratic administration which had the nominal backing of Hamas. I have been telling you that the US will make a deal with Hamas to give them what they already have – Gaza – in the upcoming peace deal. As for Mahmoud Abbas, he is likely too old and sick to handle what he knows is coming – civil war in Israel. This war, though, will include the Palestinians own brothers from America and other Western nations who Trump encourages to join in the ”peace-keeping” effort while Palestinians are kicked off their land. Ezekiel tells us that the Gog-Magog war is a war between brothers. The Trump administration has been in talks with Hamas via Netanyahu. According to Haaretz: As for the Palestinians, they have no intention to renew peace talks, certainly not when the Israeli prime minister speaks openly about annexing parts of the West Bank. When it comes to Gaza, Netanyahu is holding talks, albeit indirect ones, with Hamas. He’s [Netanyahu] allowing in Qatari money and granting Israeli concessions in return for temporary calm, while Palestinian President Mahmoud Abbas is branded by Israel as an anti-Semite, a supporter of terrorism who wants to destroy Israel. Officially, Israel denies — or rather declines to confirm — reaching an agreement with Hamas last week. An agreement with Hamas, whether concluded or signed, means that Israel has recognized the group de facto and no longer views it as a terror organization. That’s probably why Netanyahu has avoided convening his Cabinet. However, what occurred March 30 along the Gaza border — with Hamas curbing violence against Israel — was obviously the result of understandings between the sides, a type of ad hoc Israel-Hamas arrangement mediated by Egypt on the way to a broader compact. The following morning, Israel reopened the crossings, despite the five rockets fired overnight toward its border communities. On April 1, the Coordinator of Government Activities in the Territories (COGAT) announced that Gaza’s fishing zone was extended to 15 nautical miles, a range that Israel had not allowed since its 1993 Oslo Accord with the Palestinians. …The agreement to extend the fishing zone was obviously reached vis-a-vis Hamas, and not vis-a-vis the fishermen (i.e., “the general population”). “The agreement reached with Israel is just the beginning,” a Hamas source told Al-Monitor on condition of anonymity. Oh! They want to keep this a secret! Even as Israel engages in agreements and understandings with Hamas, Netanyahu treats his security cooperation partner in the West Bank as a terror organization. The agreement with Hamas probably includes – I’m speculating here – getting that pesky Palestinian Authority out of the way of both Hamas and Israel to pave Gaza’s ground to be declared a Palestinian State. The plan to empty the West Bank of Palestinians can now continue. The plan to move 1 million Palestinians from the West Bank to Jordan – this is the number given by Israel National News (Arutz Sheva) – will be the cause of the Gog-Magog war, but it could also pave the way for Gaza to continue as its own nation, a nation led by Hamas. The upcoming expelling of 800,000 Palestinians will be only the beginning of Trump’s and Netanyahu’s plans. They will want to rid Israel of all 3 million Palestinians – and not later, either, but sooner! The Palestinians will not go quietly into their ‘dark night’. They will put up a fight! I have been explaining for years that Gog will not make an alliance with Persia and the armies with Persia. Instead, Persia will come into Israel at the same time as Gog is at war with his Palestinian, mostly Hebrew brethren. When Ezekiel says that Persian enters Israel “with” Gog, it does not mean as allies. It means simply ‘simultaneously’. Keep watching. Keep praying. And get out of Babylon as soon as you can!